PICTURE PERFECT POND and CONSERVATION VIEWS! Outstanding Nohl Crest home 3/2/2 on a quiet cul de sac in the maintenance-free community of Glencliff in Westchase. 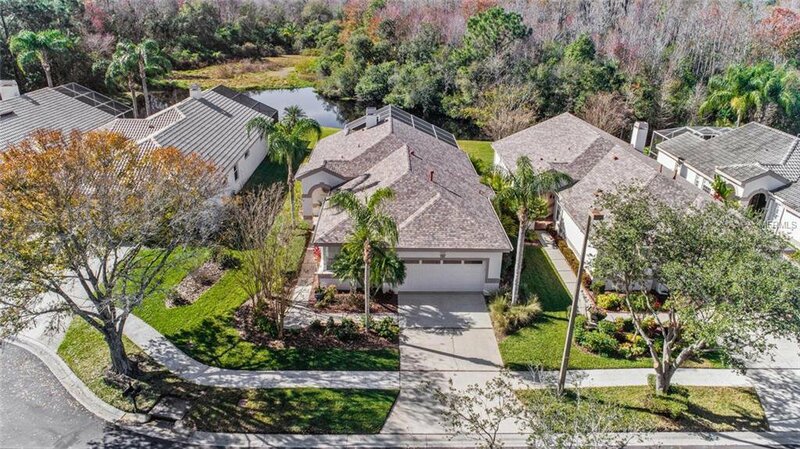 One of Tampa’s finest MASTER PLANNED COMMUNITIES. A RARE FIND -- SINGLE STORY home with new shingle roof, loads of light, VAULTED CEILINGS and large palladium window with plantation shutters and crown molding. This home has an awesome open floor plan with a great room/dining room combination plan with natural gas fireplace. Beautiful wood flooring throughout the living areas, master bedroom and second bedroom. NEW KITCHEN with GRANITE countertops, rich dark wood cabinets with soft close and full extension drawers and cabinets-stone backsplash, natural gas range, center island with wine chiller. LOW FEES! Spacious master bedroom with vaulted ceilings and lovely views. The slider in the master leads to a large paved screened patio with relaxing spa (heater and pump 2017 and 2018). Enter the covered patio area from the dining room, The secondary bedrooms are located toward the front. This home has it all gutters, see-through hurricane shutters, decorative landscape lights. Enjoy everything that WESTCHASE has to offer including POOLS, PLAYGROUNDS, BASKETBALL, TENNIS, TRAILS, all with the convenience to Tampa International, downtown TAMPA, Saint Pete and beautiful beaches! Listing courtesy of FLORIDA EXECUTIVE REALTY. Selling Office: FLORIDA EXECUTIVE REALTY.